Dum-Ford House Bed and Breakfast is a circa 1845 house complete with antique furnishings, courtyard and gardens in a small southeastern Ohio village. Guests can relax in the privacy of their room, watch a movie in the parlor or be soothed by the sound of falling water in the courtyard. 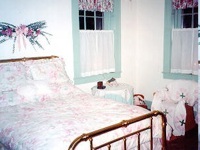 Dum-Ford House features the Clara Catherine Room (2 guests) which has a spacious room for reading, playing a game or just relaxing. There is a full size bed, private bath with shower, antique furnishings and a view of the garden. The Lucianna Suite (maximum 3 guests) has a private setting room. There is plenty of room for reading, playing a game or napping in the queen size brass bed. The Lucianna Suite also boasts a private bath with shower. Visit Dum-Ford House B and B at www.dum-fordbb.com! Spacious room for reading, playing a game, or just relaxing. 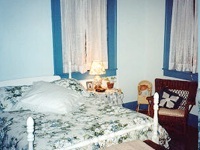 Queen size bed, private bath with shower, antique furnishings and a view of the gardens and courtyard. Enjoy your first cup of coffee while reading the morning paper in your private sitting room. Plenty of room for reading, playing a game or napping in your queen size brass bed. Private bath with shower.